When faced with a decision, whether large or small, do you tend to play it safe or take a chance? Carnegie Mellon University alumna Kayt Sukel (DC’95) explores risk-taking and how it impacts decision-making in work, play, love and life in her new book, “The Art of Risk: The New Science of Courage, Caution & Chance.” By blending science with real case studies, Sukel provides insight in understanding individual behavior and furthering personal success. Sukel, who majored in cognitive psychology, is a passionate traveler and science writer. Her work has appeared in the Atlantic Monthly, the New Scientist, USA Today, The Washington Post, ISLANDS, Parenting, the Bark, American Baby and the AARP Bulletin. She is a partner at the award-winning family travel website Travel Savvy Mom and is also a frequent contributor to the Dana Foundation's many science publications. She recently took time out of her busy schedule to answer a few questions for Dietrich College News. Why did you decide to write a book about taking risks? Do you consider yourself to be a risk-taker? I lost my mojo and I wanted it back! I used to consider myself quite a risk-taker. At least, that’s how I was often described by others. I dropped out of high school to go to CMU, I traveled extensively, I followed my heart (and my instincts) when it came to my career, and I tried new things whenever I was able. And I thought for a long time that my risk-taking was the key to my success, such that it was. But, then, a few years ago, I got divorced, moved back to the U.S. after quite a few years abroad, and found myself in a slump. I wanted more for my life but wasn’t quite inspired enough to get off my couch and go get it. I think a lot of us feel that way. We get into a routine, we rely on our habits and we stop growing. So that’s where the idea for the book was born. Because if risk-taking was the key to my prior success, (1) I needed to figure out what it actually was, and (2) I needed to find a way to harness it, despite my newfound reticence, to make it work toward my advantage again. So that’s what I set out to do. What type of experts did you turn to for insight into risk-taking? 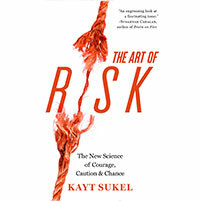 I looked to two types of experts in “The Art of Risk. First, of course, the scientific experts who are studying the brain and genetic science behind risk-taking, including J. David Creswell at CMU. But I also wanted a sort of real world system of checks and balances to see how well the science stood up outside the laboratory. So I also interviewed successful risk-takers like Steph Davis, a free solo climber and BASE jumper; Andy Frankenberger, a two-time World Series of Poker champion; and David Baskin, a world-renowned neurosurgeon. It amazed me how well the stories actually did sync up. What was the most surprising thing that you discovered? That we are all, each and every one of us, risk-takers. Because risk-taking is part and parcel of everyday decision-making, and it’s a process not a trait, all of us have the power within us to use risk to our advantage. It’s not just the stuff of super heroes, legends and drug addicts: risk is the key to learning and growth for all of us. How does your psychology background aid you as a science writer? CMU’s psychology program is rigorous and disciplined. It helped me learn how to be a curious skeptic — and ask a lot of important questions. It also instilled in me a rabid fascination about the brain and how it inspires thought, feeling and behavior. If you could tell your CMU-student self one thing, what would it be? Besides always be sure to buy quality fence paint?! I’d tell myself that science majors can travel many different roads — and that it’s okay if you don’t end up in academia. Some of those other paths are just as fulfilling. I hope to do more speaking in the next year — it’s a lot of fun to discuss the science of love and risk to different audiences. And I’m also starting to think about my next book. But in the meantime, I just want to investigate and write about exciting new neuroscience discoveries. We’re really only at the beginning of one fascinating scientific journey — and I can’t wait to learn more.